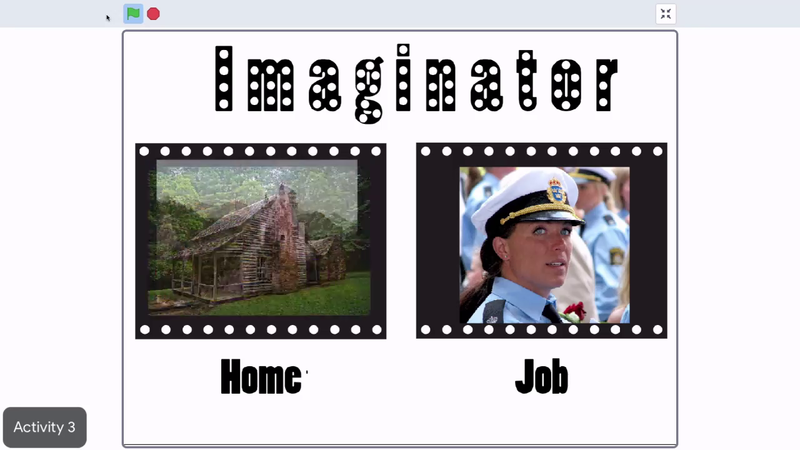 Today you'll build an Imaginator that will help you imagine your friend's future. Your friend will see several options for places to live and work. All your friend has to do to see the future is press the space bar. I wanna live in a castle. Well that's perfect because it's one of the options in my project. To build this project you'll use a loop. A loop makes an action in your code repeat. Hand clapping games like this one use loops. After you finish watching this video you will remix this project. Remixing lets you use a project someone else created and make it your own. In this case the project contains a neat background and two Sprites that you will add the code to. If you get stuck ask your friend for help. Taylor will take you through the steps to build your project and I'll see you in the last video. Click on my starter project link next to this video. After you finish click back on this tab then click the green arrow to move on to the next video. Click on the Starter project link next to this video.